The fight against Taxmageddon is making progress. The Revenue Committee has now, twice, postponed votes on their tax monstrosity. Their latest approach is to piecemeal it through, hoping to fly under taxpayers' radar. Assorted statists provide increasingly aggressive support for these tax hikes. They use all kinds of arguments about how government is not growing, government has been starved and cut to the bones, and so on. As we approach the 2018 session - one of the most important in our state's recent history - the debate over the size of government is only going to intensify. Therefore, it is important for us friends of liberty, economic freedom and limited government to learn how to counter the statist narrative. When the economy first began unraveling during the Great Recession, most governments didn’t feel it right away. Then, as revenues began to tumble, states and localities cut back on services, implemented hiring freezes and left vacancies unfilled. By 2010 and 2011, many state and local governments were shedding staff and making sizable cuts to agency budgets. The economy since then has recovered at a sluggish pace, but governments have recuperated even more slowly. Today, many jurisdictions continue to operate with staffing well below pre-recession levels. Given that this month marks the 10-year anniversary of the official start of the recession, it’s worth considering whether limited staffing and resources can ever rebound fully, or whether they have become a more permanent fixture of the public sector. b) this downsizing has lingered on and virtually become permanent. There are two ways to verify whether or not these statements are true. The first would involve a simple examination of state and local government employment numbers, but that would not really provide any useful information. The point is, namely, that we should expect government to reduce its number of employees in recessions, for the very simple reason that the private sector - by definition - reduces its economic activity during recessions. With that reduction comes a decline in employment, and in tax revenue. When tax revenue declines, it means that the private sector is no longer able to pay for a same-sized government. Alas, government needs to shrink itself to stay in parity with the private sector. Wyoming stands out with an increase from 1 to 1.077, a 7.7-percent rise (and we are all very surprised). 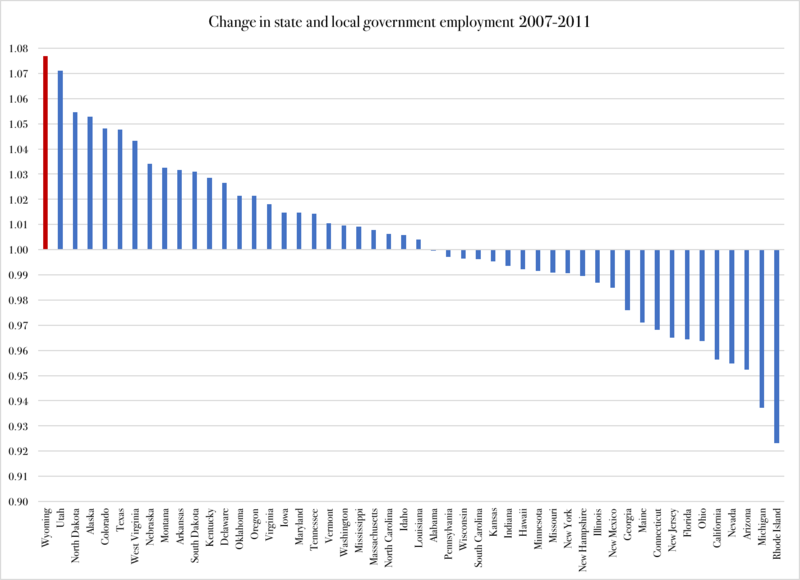 Rhode Island, by contrast, saw the largest decline in state and local government employment. In other words, there is no discernible trend in government employment, none whatsoever. The Governing.com article is wrong, as are all those who make sweeping claims about state and local governments in full retreat. 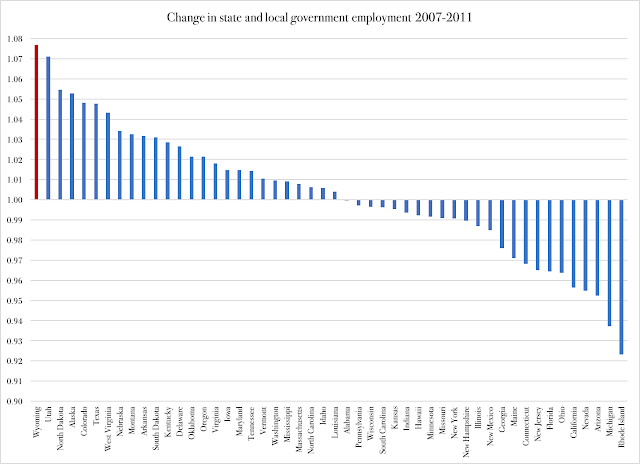 In some states, governments reduced their payrolls, in some states they increased it. Now, all of a sudden, 29 states saw government employment increase. Hardly consistent with the statement in Governing.com, unless, of course, we read that as "returning to pre-recession levels". That, however, would be a moot point in this discussion, because it would again rely on the premise that there is some kind of axiomatic size of government that should exist regardless of what the private sector can afford. 1. Pull employment data on private and government employment from the Bureau of Labor Statistics database, for a long enough period to bridge over business cycle swings, in this case 2002-2016 (to focus only on annual data). 2. Add state and local government employment together; this neutralizes differences in how states allocate spending between the state and local governments. 3. Calculate the Government Employment Ratio* (GER) for each state, for all the 15 years covered. 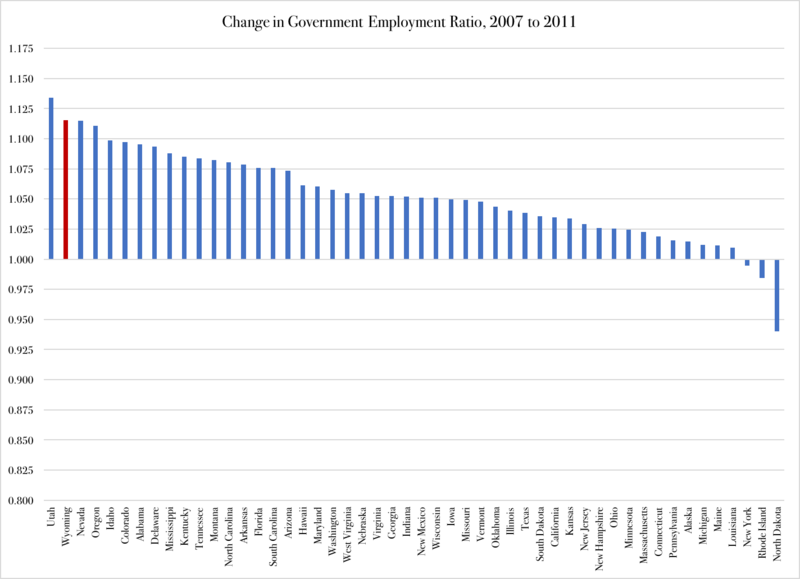 That does not look like a trend of plunging government employment. 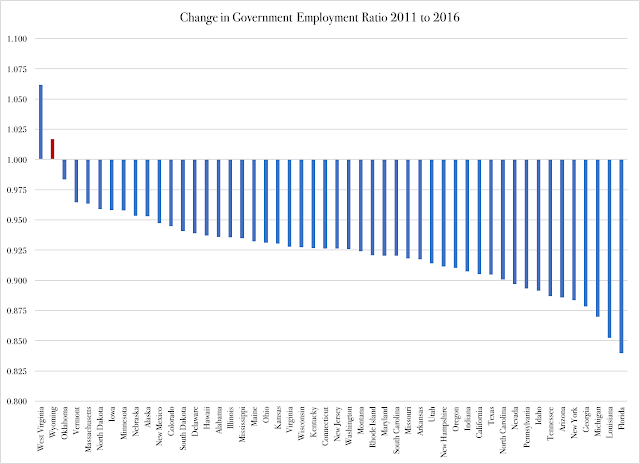 On the contrary, even when government did reduce its number of employees - as Figure 1 showed it did in 24 states - the decline was almost without exception smaller than the loss of private-sector jobs. 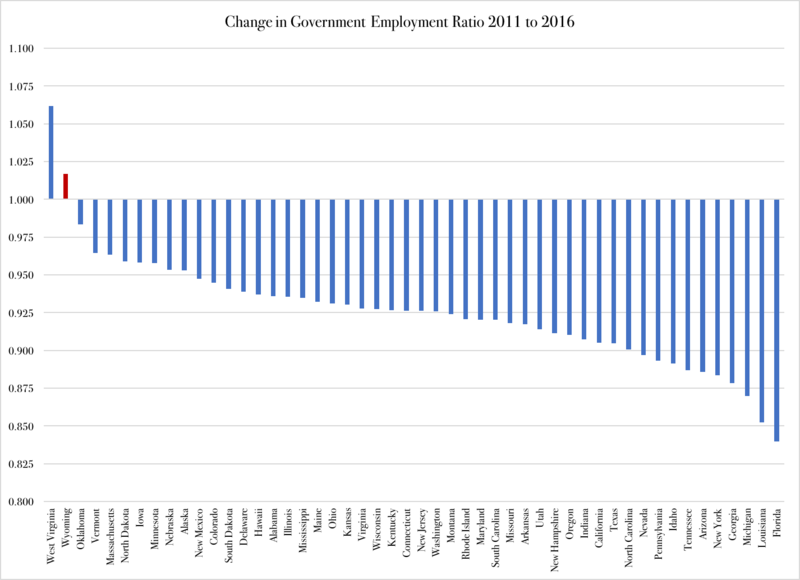 In other words, if there is any trend in government employment, it would be in the opposite direction of what Governing.com suggests. At last, we find one piece of evidence that somewhat verifies what the Governing.com article claims. However, it is not the kind of number they use - since the Great Recession, government employment has indeed increased, as we saw in Figure 3. 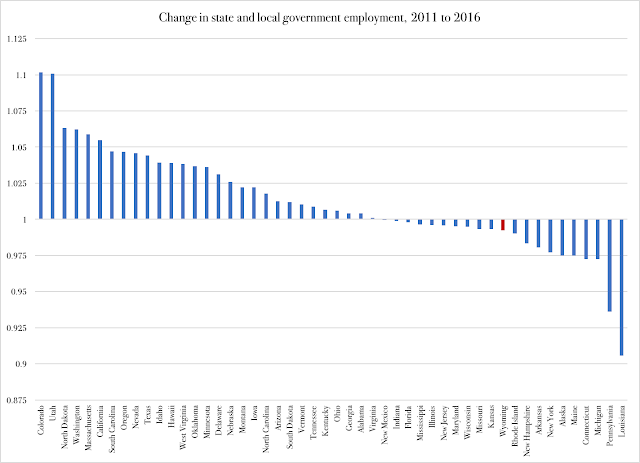 No, the trend that we find is in relative government employment: its increase after the recession has been slower than the increase in private-sector employment in all states except two (and we are all very surprised that Wyoming is one of them). There are about 7.5 million full-time equivalent state and local government workers, excluding those in education, according to last year’s Census Bureau survey of governments. That number is 3 percent below the levels of March 2008, shortly after the recession began. Taking population growth into consideration, noneducation local government employment per capita is down about 8 percent, while state employment is nearly 11 percent lower. However, this is - again - a moot point. If the private sector employment declines, then it is only reasonable to expect that government employment will do the same. d) the "demand for services" mentioned is, plainly and bluntly, government spending; if our elected officials decide to grow spending faster than tax revenue, then the responsibility is theirs, not that of taxpayers. Here, again, we have an example of an implicit axiom at work. The term "demand for services" assumes that those legislators who grow government spending are doing so because we, their voters, explicitly demand more spending, i.e., more services. Yet that is practically never the case: legislatures all around the country put government spending on autopilot, with built-in growth parameters such as automatic cost mark-ups for salary advancements, baseline spending hikes (you know, the kind of mechanism that defines a "cut" in spending as a growth rate below the baseline) and quality definitions for in-kind entitlement programs that lock in cost increases. *) The Government Employment Ratio is: the number of state and local government employees, added together; divided by the number of private-sector employees; multiplied by 1,000 to get nice, whole numbers to work with. When Is Government Big Enough? What's That In the Sky? A Bird? An Airline!